This is the third article in our four-part series on kitchen cabinetry choices viewed through the lens of the Zodiac. We have previously covered water and earth, and now it’s time for air. The twelve zodiac signs each have a main element: earth, fire, water and air. Air signs are interesting and some pretty cool kitchens can come out of their choices. Aquarius likes all of the extravagant and new things out there. The more artistic, the better. They really enjoy their freedom. A light, airy design would really fit their personality, as well as white or other neutral colors so that when they just wake up and on a whim decide to change the wall colors or add a new table set, they won’t feel restricted by the complete incompatibility of the new and the old. Their artistic nature might provoke them one day to paint the fridge and change the polish of the cabinet doors, in which case it is a good idea to get kitchen cabinets that allow flexibility, such as a wide variety of interchangeable parts and modules. 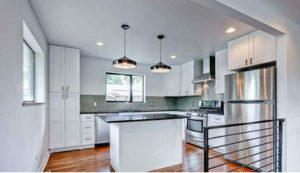 We here at RTA Cabinet Store recommend Traditional White Shaker RTA kitchen cabinets for them (https://www.rtacabinetstore.com/RTA-Kitchen-Cabinets/traditional-white-kitchen-cabinets/) as they go with pretty much anything and provide a multitude of size and door/drawer choices, and are a pretty good canvas for painting in the future! The Libra doesn’t need any help with the interior design. Their unique sense of style, harmony and aesthetics have no match in the zodiac. Most likely they already have their own interior design company or a book series on the shelves. Every room will match an overall concept for the house and the alignment of the kitchen will follow the golden ratio. RTA kitchen cabinets are perfect for them, as they can get exactly what they want, and design it to boot. Whatever their idea is, however, they will make sure that they’ve consulted everyone in the house and that no one’s needs are neglected. The extreme quality for low money ratio of RTA Cabinet Store’s RTA kitchen cabinets will appeal to them very much. Bamboo Kitchen Cabinets for the Twins? A Gemini’s kitchen will be quite eclectic. They like to learn a bit of everything and get a touch of everything. Their kitchen solution will have class, style, a sense of innovation, respect for tradition and provide them with long-lasting stability in their lives. That sounds like a description of our Brazilian Cherry Bamboo kitchen cabinets if we ever heard of one! One of Gemini’s main traits is that it is hard for them to stick to just one idea or concept, unless it is style and unique to the max. Every sign, though, can take advantage of a no obligation, completely free kitchen design consultation with one of RTA Cabinet Store’s professional designers at https://www.rtacabinetstore.com/free-kitchen-design-help. It’s great, and can help anyone zone in on their perfect kitchen!